Leeds owner Andrea Radrizzani has written to the Football Association, Premier League and EFL to ask for clarification on the link between Wolves and agent Jorge Mendes. Radrizzani questioned the legality of the link on Twitter after the Championship leaders beat Leeds 3-0 last Wednesday. A subsidiary of Wolves owners Fosun has a share in Mendes' agency and several of his clients are at Molineux. "I want to understand the rules so I can act like them," Radrizzani told BBC Sport. "If it's possible I would do the same as it's been proven to be successful for the team. If not I will do as I did in the past, which I'm happy with too." Wolves chairman Jeff Shi told local paper the Express and Star on Monday that criticism of the club's relationship with Mendes was "laughable". Wolves have also said they would welcome a meeting with the EFL after the matter was raised at a league meeting on Thursday. During a series of tweets on Wednesday, Radrizzani said: "We have our own problems but we should play in a fair competition. "Not legal and fair [to] let one team owned by a fund whom has shares in the biggest players' agency with evident benefits (top European clubs giving players with options to buy... why the other 23 teams can't have the same treatment?)" The Italian, 43, said he posted the messages to draw attention to the issue, rather than through frustration at the defeat, before sending a "formal letter requiring clarification" to the FA, Premier League and EFL on Monday morning. Radrizzani said he was not "playing any war against anyone" and that his comments were not meant in relation to the on-field achievements of Wolves, who are three points clear at the top of the Championship. "They are playing great football and they are managed by a very good coach so they deserve to be top of the league regardless of money or investment," he said. "It's an opportunity for me to clarify the rules because I want to build a successful team on the pitch like Wolverhampton. "To do it I might need to have five or six players on loan from an important agent or important clubs in Europe. I need to understand if it's practical as I would like to do the same." He added he had written to the Premier League to "make sure everything is in line with both leagues". "If I do something that is not contemplated by the Premier League I will lose my time to build something that is a success and then which maybe has to stop when I reach the Premier League," he said. Shi said he also was "surprised" by Radrizzani's comments because he had had "several lunches" with the Italian and Mendes. "I know many agents - I know Jorge Mendes well. I would love to have their help. I just want to know if it's possible to do it within the rules," said Radrizzani. "I might not even need an agent because I have good relations with many football teams in Europe personally. I want to understand the rules and if possible use them and the leverage of agents in circumstances like that." Radrizzani said he was advised by his lawyer to sell his share in an agency in Italy when he started the process of buying Leeds from previous owner Massimo Cellino, with the takeover completed in May 2017. "I did because obviously there is a conflict of interest and I always pay attention to staying within the rules," he added. The FA's rules on third-party ownership state: "No club may enter into an agreement which enables any party, other than the club itself, to influence materially the club's policies or the performance of its teams or players in matches and/or competitions." Since Fosun took over in 2016, it has been understood that Mendes assists Wolves only in an advisory capacity and the club do not believe they have broken any rules. Wolves chairman Jeff Shi said criticism of the club's link to Jorge Mendes is "laughable"
Shi suggested Radrizzani made his comments because the he felt under "pressure" after a disappointing season at Elland Road. Leeds are currently 13th, 11 points off the play-offs, following a 2-2 draw with strugglers Reading on Saturday. Radrizzani rejected Shi's claim, adding he had "enough reason to be upset" before the Wolves match following a 3-0 defeat by Middlesbrough earlier in the month. "There was much more pressure in the previous game against Middlesbrough - that was really our last call and the way we played and what the players showed in that game was really awful," he said. "I was frustrated about my team before the game with Wolverhampton, which I went to with not much hope to be honest, because I understand they have another level of quality on the pitch." "I used the occasion to raise something which nobody had given me attention about for months. Sadly, finally I got some attention." When asked whether he regretted his tweets, Radrizzani said: "No, I'm very pleased I've done it. I'm very tough and direct and I can't change myself. I never regret what I do whether it's good or bad. "It looks like the wrong timing because it looks like I was trying to justify a bad defeat. "I was frustrated for sure about the difference in quality between the two teams but that's the regulations. To get attention - that was my aim." 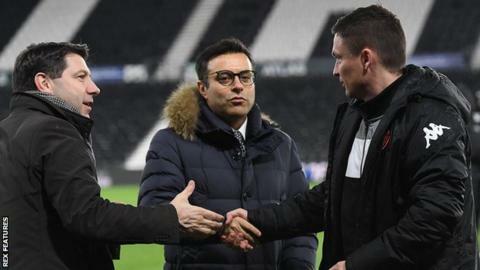 Radrizzani said his side did not have the "continuity or mentality or strength" to maintain a promising first half of the season that saw them reach Christmas in fifth place. He added he has seen "better mentality and better communication" under manager Paul Heckingbottom, who took over after Thomas Christiansen was sacked in February. "I wanted to build in the players and the team a winning mentality but we were very far from that. We need to work a lot," he said. "Hopefully it's a learning curve and we need to improve next year. I understand the disappointment because the fans deserve more." It has been reported that several Championship clubs have raised concerns about the influence of Mendes - who represents Wolves head coach Nuno Espirito Santo and a number of players, including £15.8m record signing Ruben Neves and on-loan Atletico Madrid forward Diogo Jota. "I'm aware that other clubs have concerns about this," said Radrizzani. "I hope they have someone else acting like this and coming out like me and to share the concerns with the league. "It's something we need to understand and move on in respect of the rules."